City planners continue to evaluate the impact on global warming and our environment as buildings are constructed, parking lots are paved and the growth in downtown areas continues to swell. With that said, landscape architects have played an important role in designing ways to bring GREEN into an otherwise concrete and steel world. Green Roof and Green Wall designs have expanded over the past years from simple “green plantings” of sedum or grasses and wire walls to site specific designs incorporating recycled materials, improved growing mediums, and water collection systems for recycling of rain water for a total package of environmentally friendly project. Today we offer several products for you to consider with your next design project. 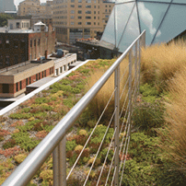 GeoEdge is a flexible aluminum edge restraint system that works great for green roof systems because of it’s multi-height and component system design. 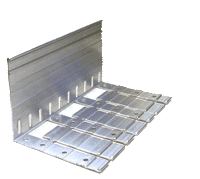 With the L-Shaped profile and options for solid wall, or slotted wall you can design to allow for water runoff or containment depending upon the roof application. Used in conjunction with permeable pavers you can design a complete roof system for soil containment, plantings, and pathways or patios for pedestrian use. GeoEdge has been proven successful bor both intensive and extensive greenroofs, and qualifies for LEED points. GeoEdge is a lightweight, flexible restraint that provides a finished look and assures an easy installation, making it a great alternative to poured concrete in permeable pavement applications. Stainless Steel Netting – WEBNET. Special flexible stainless steel nets, known as WEBNET can be attached to stairs, railings and multiple structures to allow for growth and training of vines for a lush green wall effect. Within a short time period the cables generally become non-visible making for a living wall to blend with any architecture. Catenary Cable with Vertical Cables Hanging – This trellis type system is new and unique in that it does not require any wall or permanent structure behind it for attachment. The Catenary cable is larger in diameter and installed as the primary “structure” from which then smaller cables can be attached vertically or horizontally to create the design. Traditional Volume or 3D Trellis Systems – These systems consist of panels that are generally attached to the outside building wall. 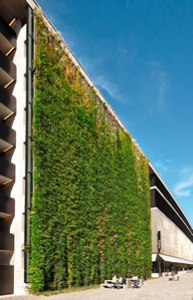 The shading that these green walls create for the building keeps the inside of the building cooler during summer heat and warmer during the winter months resulting in reduced utility costs for the building owners. Have an upcoming project that you think would be a great opportunity to explore ways to incorporate these ideas or potentially other environmentally friendly designs? At Landtech Design we continually expand our thinking and challenge our team to include irrigation designs for these and many other designs to deliver a successful project to the consumer with water efficiency and plant health being our primary goal. Look to the irrigation design experts Landtech Design to partner with your design team for a winning team.